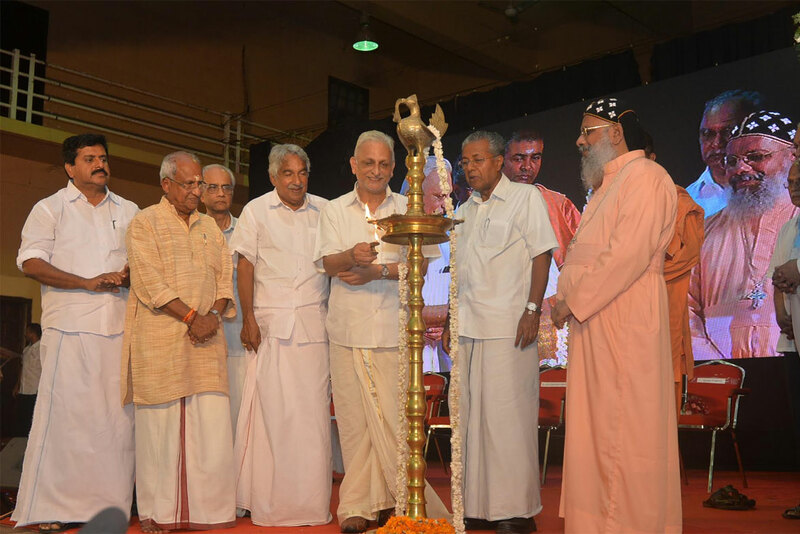 Thiruvananthapuram, June 10, 2016 – Soft strains of Hindustani classical music wafted through the stately Senate Hall in this city as dignitaries began arriving for a function to felicitate Sri M and the Walk of Hope 2015-16. The excitement was palpable as Sri M arrived followed by the Chief Minister of Kerala, Shri Pinarayi Vijayan, signaling the beginning of the ceremony. A documentary on the 474-day, 7500 km padayatra followed with a rapt audience watching the saga of dedication, courage and sacrifice for the cause of peace and harmony. 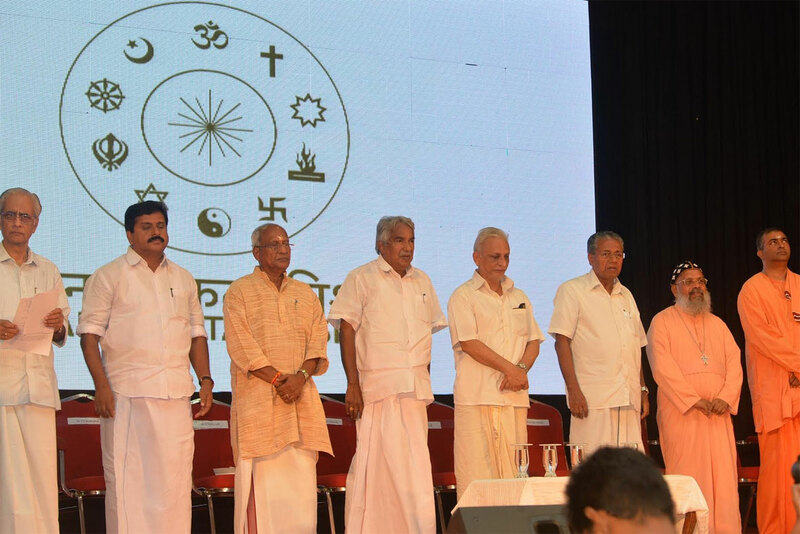 Shri Jayakumar, former Chief Secretary, who presided over the function, remarked that all assembled were blessed as they had witnessed the extraordinary deed of a man returning after walking the length of India—spreading the principles of peace and oneness. He said Sri M was pointing to a place beyond religions and drew attention to the question Sri M often asks, “Why hatred among humans during the short drama of life?” He also pointed out how Sri M observed Nirahara Satyagraha against terrorism and violence five times during the padayatra and planted trees wherever he went. He invited all to be part of the massive tree planting drive. 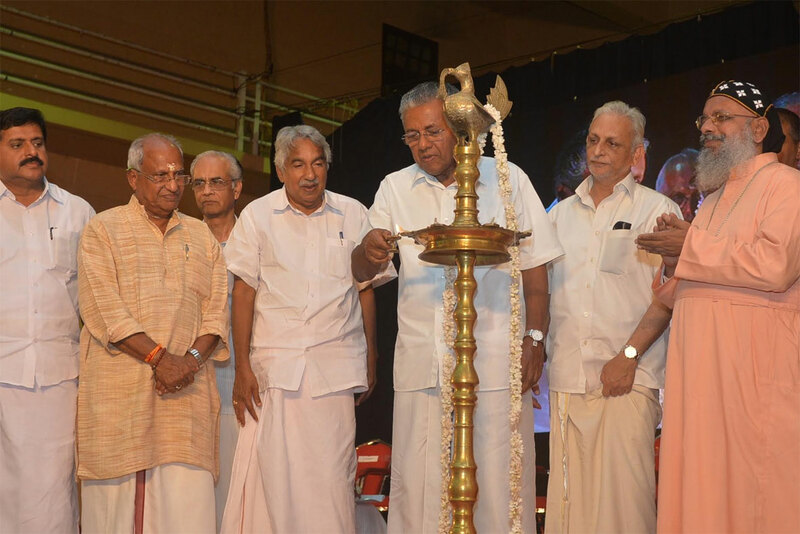 The dignitaries lit the ceremonial lamp together and Chief Minister PinarayiVijayan,honoured Sri M with a ponnada. The Chief Minister said Sri M was a different spiritual luminary who did not link spirituality to religion. Another noteworthy difference he found in Sri M was that he didn’t highlight afterlife and heaven as many of his peers did. His advice was to make this life meaningful with deft interventions. He was also a man of action who not only spoke but actively entered public life—the padayatra being one such example. He added that Sri M was not only walking, but also simultaneously educating the youth along the way—forging friendship among religions. In times tainted by hurt, strife and pain, Sri M’s efforts act as a balm. He added that to bring people together there should be men like Sri M, guarding against divisiveness and religious hatred like a sentinel. No religion teaches hatred but nowadays many resort to divisiveness for narrow goals. Sri M walks a path less trodden—a man born a Muslim, taught by a Nath Guru and Sufis, married to a Brahmin, and running a tribal school, he said. 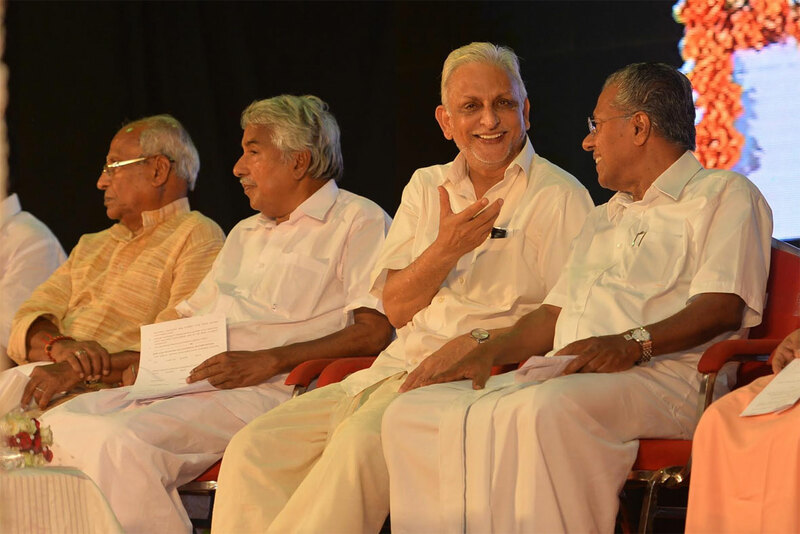 ShriOommenChandy, former CM of Kerala, said that the slogan of ManavEkta raised by Sri M is the need of the hour. The welcome received by Sri M during the Walk was there for all to see. He said he was happy to have been a part of it when the Yatra started out and reached Thiruvananthapuram. He added that a new Yatra was on the anvil and wished it all the very best. He also expressed the desire to be part of that walk as well. Shri O Rajagopal, former Union Minister and MLA, mentioned that he took part in the function in Thiruvananthapuram in January 2015 as the padayatra entered the city from Kanyakumari and that he also participated in the Walk for a while. He could understand from the documentary that the acceptance received by it was universal, as the collective consciousness of the country had not forgotten the age-old Vedic dictum, ‘Ekam sat viprabahudavadanti’. 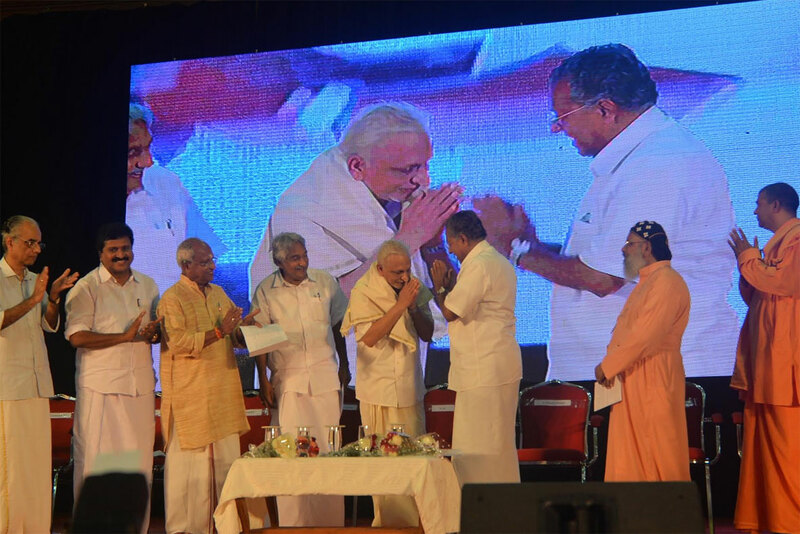 The message of Sri Narayana Guru that ‘Whatever may be one’s religion, the aim is to be better ourselves as human beings’ was echoed and demonstrated by Sri M. He thanked Sri M for the padayatra and said he felt that the next walk planned would strengthen India further. ShriSivakumar, MLA and former State Minister, applauded Sri M’s padayatra which upheld unity in diversity over 474 days, eleven states and covered millions of people. He said that ours was the most spiritual society in the whole world. But, currently, he said growth of human society was stunted due to strife and dissension, which in turn prevented national growth. He added that similar padayatras with noble intentions would overcome many of the challenges faced by us today and assured that the whole nation would be behind Sri M in his endeavours. Dr Gabriel Mar Gregorios of the Malankara Orthodox Church said that he had wished to undertake a similar journey, but could not do it. He said that all those who witnessed the documentary on the padayatra, even those who had travelled extensively abroad, would be stunned by the diversity of our country. Also, one could note the strong thread of Indianness, which binds all of us together, he said. He hoped that this VIBGYOR-like diversity was never lost. He asked what use was religion if its practice did not enable people to love each other. He added that as one moved forward on the divine path, one could not but become more and more humane, verily the message of Sri M’s Walk of Hope. 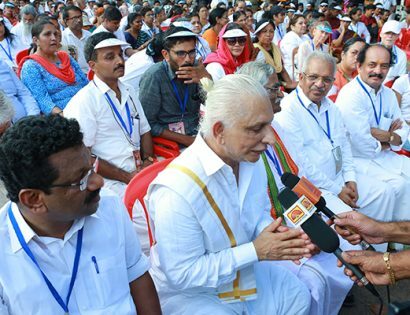 SwamyMokshavrithananda, President of the Sri Ramakrishna Mutt, Trivandrum mentioned Sri M’s continuous connection with the Mission and said the video of the padayatra shows that there is hope for this country. Cutting across states and religions, the acceptance and welcome for ayatra of this kind can clearly be seen throughout, he said. He felt that Sri M is a symbol of hope and wished him health and vigour to undertake similar efforts. He said that just because it was in Sanskrit did not mean that it belonged to any religion. Sanskrit is a 3000-year-old language and the prayer meant that ‘May everyone be happy’. He said that he did not want to speak much as he felt that his walk was his talk. The quote that became very popular with the padayatris during the walk is originally from St Francis of Assisi, who also used to walk a lot with his disciples. He explained why he had chosen Kanyakumari as the starting point of the Padayatra—first, it was a ‘sangama’: a confluence of three oceans which also symbolised what the walk was all about; also, it was there that Swami Vivekananda meditated and drew up a blue print of his plan of action for India. 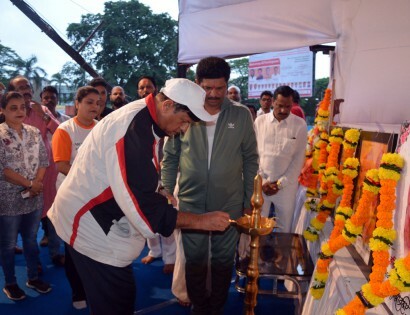 The walk began on January 12th, which was fittinglySwamiji’s birth anniversary. He fondly remembered all those who had walked with him throughout the padayatra, braving many hardships, and lovingly termed them the real heroes of the day. He remembered the great ‘parivrajaka’ who roamed the streets of Jerusalem 2000 years ago, with no place of his own to lay his head. He spoke about two Yatras—one, the external walk and the other, the internal walk. He said though the physical walk was over for the time being, the mental walk continued till the goal of ManavEkta could be achieved. He then explained the principle behind the Vedic hymn ‘Ekam Sat Viprahbahudhavadanti’ —that a “spark of the divine is within all of us and that as such, all humans are moving temples/churches/ mosques. The only way to worship these moving sanctums was not by doing Arati but by service or Seva. If people understand this, there will be no strife in this country. We have said this wherever we went, temples, churches, mosques, Gurudwaras etc.” He said, if there was still any unrest, he would be ready to go there and walk, not caring for stones or bullets. He said that there is no country like India and our duty is to maintain this uniqueness. He shared his dream that India would regain its role as the teacher of the world once again. 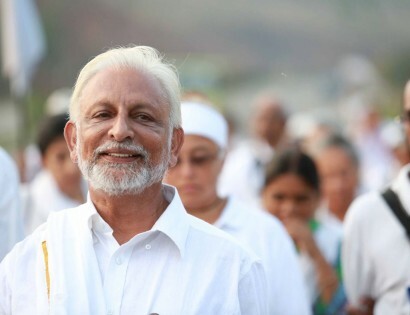 He informed everyone about the next padayatra he would undertake, calling it M2M – from Madanapalle(Sri M’s Ashram) to Mizoram in the North East. He added that Keralites were also welcome to join the same though it would not pass through Kerala. He also spoke about the invitation he had received to lead a padayatra for peace in Zurich and Berne, Switzerland during the last week of March 2017. The public reception concluded with a vote of thanks. The packed house waited till the very end to congratulate and express gratitude to the city’s own son, Sri M, who had captured the heart and soul of the country with his monumental feat for the cause of peace and harmony.